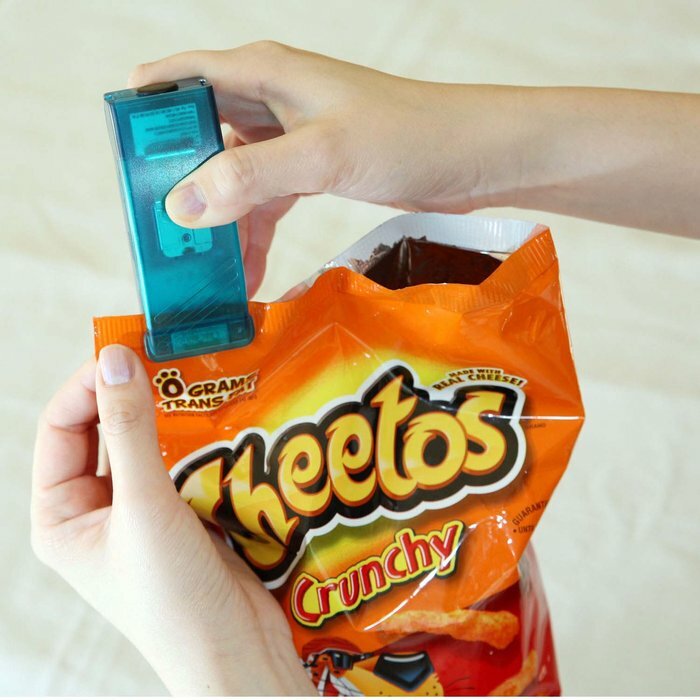 CouponInsanity - 10 Clever Kitchen Gadgets you will Want and Need! 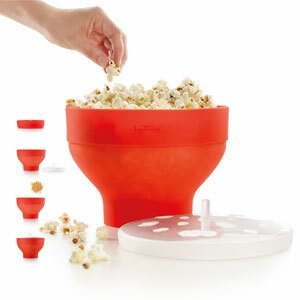 Home > Lifestyle > Trending > 10 Clever Kitchen Gadgets you will Want and Need! 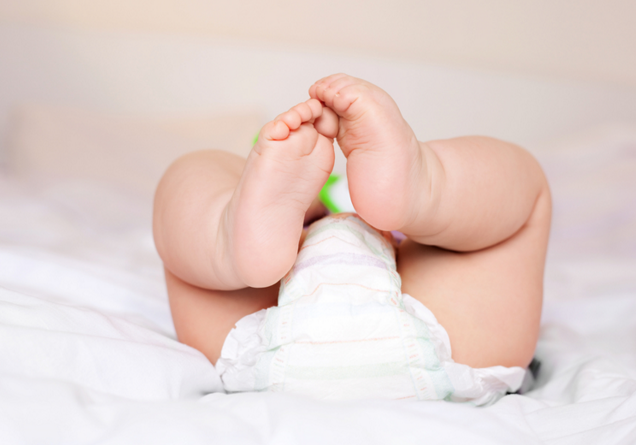 These items will make you wonder how you ever lived without them! The Bag Re-Sealer™ quickly re-seals unfinished chip and snack bags, creating an airtight seal that helps keep food fresh longer. Simply slide the Re-Sealer along the top of your unfinished bag and the built-in heating element automatically and instantly seals the opening back together! Plus, the Re-Sealer is sleek and colorful and has a magnetic base that easily sticks to the refrigerator! 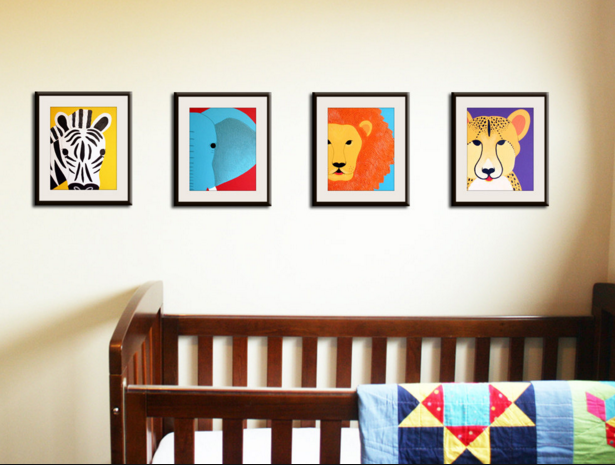 Click here to buy on Brookestone. That's right, there are spice holders that automatically measure out 1/4 teaspoon per click for you. Plus you can open it up at the top to pour out more on a need basis! 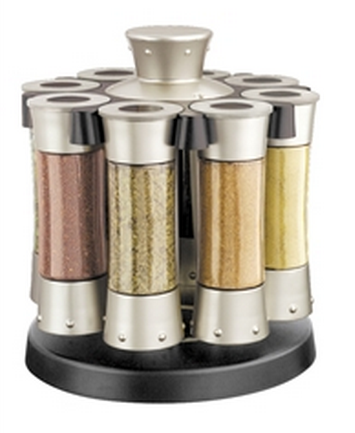 Click here to find out more information and to buy the Satin Auto Measure Spice Carousel! This is a dream come true, a colander and serving bowl in one! Ventu is a multi-purpose bowl that allows you to prep, strain, serve, and store—all in one elegant solution. 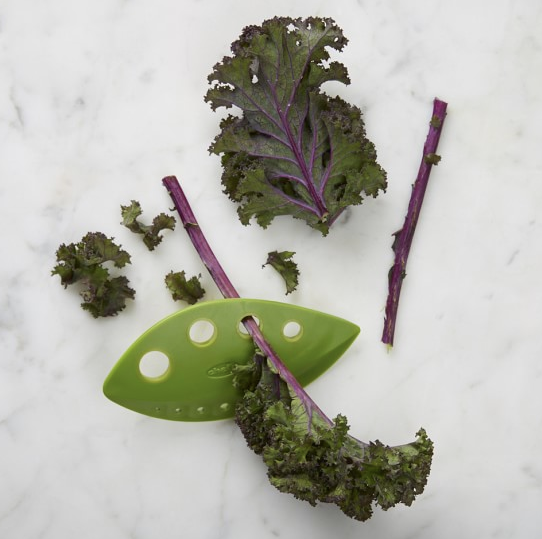 Use it as a colander to remove excess water from pasta, salad greens, fruit, and more. To switch from its straining function to serving is easy: just pop its silicon-sealed base onto the bottom, and save yourself from washing extra dishes. Click here to find out more and where to buy! Prepare healthy and home-made popcorn in just 2-3 minutes with kernels in the microwave and add whatever flavors you like! 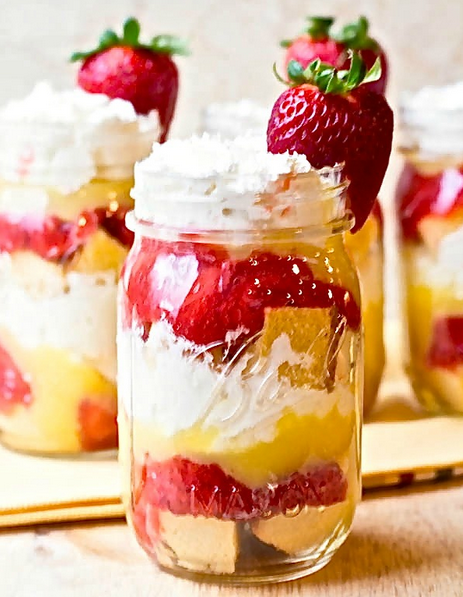 It's easy to use, simply add the corn kernels, heat in the microwave and enjoy! Watch over 90% of the corn kernels pop. And as an added bonus, it is collapsable so it won't take up much space in your cabinet and will make it easy to store! Click here to find out more and where to buy! The Garject is one powerful garlic press: it easily and completely presses multiple garlic cloves at once, without the need to peel first. 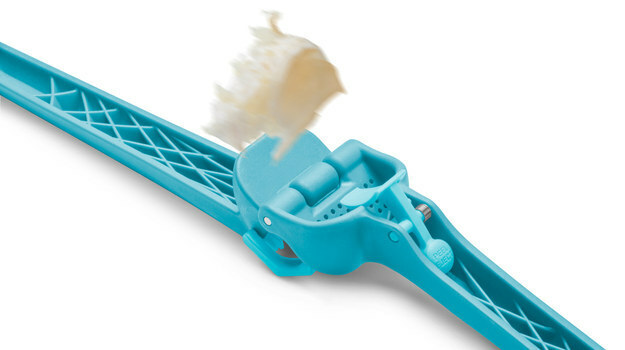 Plus Garject automatically scrapes off any excess garlic and cleans itself as your open the handle. 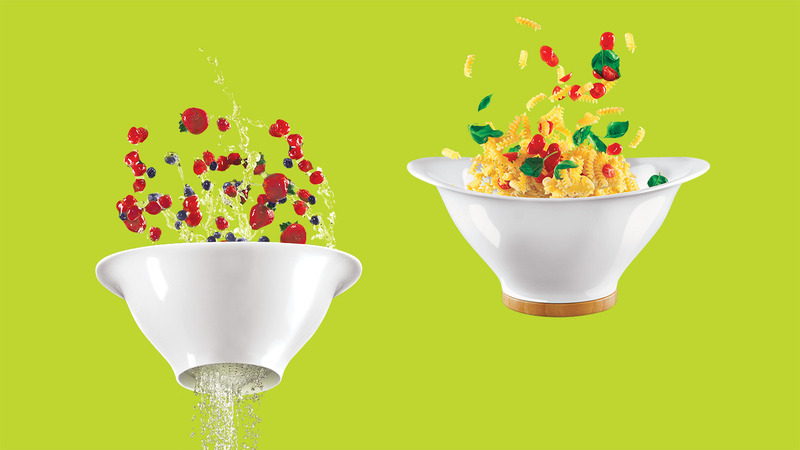 Simply push the 'peel eject' button to shoot the peel into the bin, rinse under water and Garject is perfectly clean. This clever design ensures all of the pressed garlic gets into your meal and never on your fingers. Click here to buy the Garject! Cut and slice your herbs 5 times more quickly than with a knife! This tool is practical with it's 5 stainless steel blades speeding up the cutting process to make meal preparation much faster. 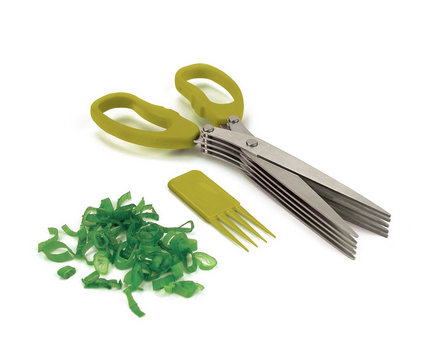 Plus this herb scissor comes with a cleaning tool that helps get all herbs between blades and to better clean scissors. Click here to find out more and where to buy! Have ready to use pineapple rings in seconds. 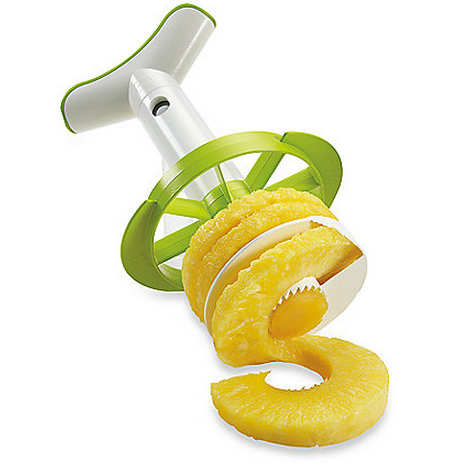 This ingenious pineapple tool quickly and easily peels, cores, and slices for delicious serving size pieces every time. The Pineapple Corer, Slicer, and Wedger works like a cork screw, removing the flesh in perfectly formed rings while leaving the core in the shell. Turn once for one slice or slice it all. Plus, the pineapple shell remains intact so you can use it for serving a dessert or fruit salad. Click here to find out more or to buy from Bed Bath & Beyond. 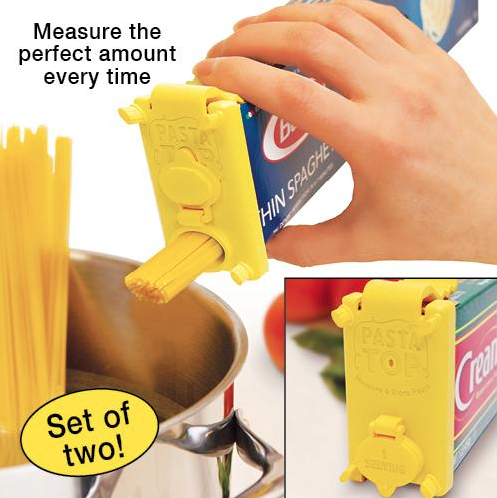 Measure a perfect portion of pasta every time The spill proof Pasta Top directly fits on any 1 lb box of pasta. Simply swing open the locking tab for a perfectly measured, 2 oz serving of pasta every time, assisting with portion control. Prevents spills during storage and allows the box to store upright or on its side. Dishwasher safe. Plastic. Come with a set of two. Click here to find out more or to buy! Enjoy fresh corn without the mess of eating from the cob. 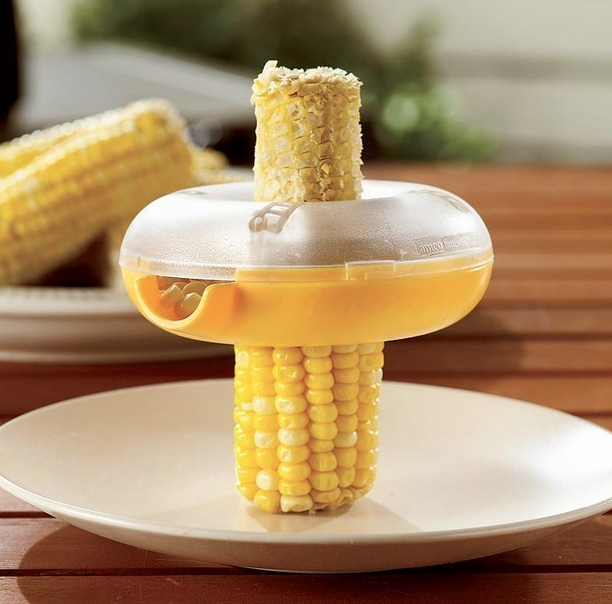 With our Corn Kerneler, you can easily remove corn kernels from the cob in one quick motion. Just place the Kerneler at the narrow end of the cob and push straight down. Stainless steel blades quickly and easily remove the kernels, which then collect neatly in the basin of the Kerneler. Just pour the kernels out and start again—easy! Click here to find out more and where to buy! Count on this handy tool to quickly remove the tough stems from your favorite greens and herbs, leaving the tender leaves ready for smoothies, salads or cooking. Eight holes in graduated sizes fit everything from large kale leaves to slender sprigs of oregano. To separate the leaves, simply pull the stem through the correctly sized hole. Click here to find out more and where to buy!